Cold remedies become important as we approach winter and cold and flu season and you start to wonder what you can do to avoid those nasty bugs and the misery they bring. Whether you get a flu shot or not there are other measures you can take to decrease your risk of illness or help shorten your recovery time. First, let's understand a little more about the enemy. 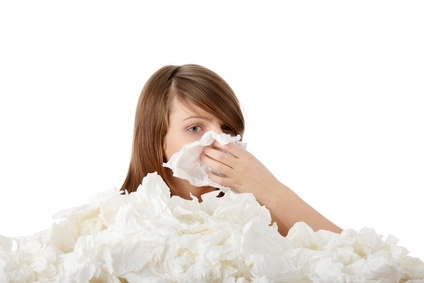 The average person has 2 to 4 colds a year and a 20% chance of getting the flu. The risk is higher for women, especially those with young children. The peak season; the time everyone starts looking for cold remedies is from mid-October through February. In the early stages, it can be hard to tell the colds and the flu apart. The flu causes fever that's generally over 102 degrees, muscle aches, headache, and often a dry cough. Colds typically don't cause that high of a fever. Avoid antibiotics. They are not cold remedies as they have no impact on colds and flu (which involve viruses and not bacteria) and only help create drug-resistant supergerms by killing off the less competitive bacteria. Here are a number of ideas for cold remedies that you can use. Getting enough rest keeps your immune system working well. If you feel tired you can assume that your immune system is tired too and also not functioning as well. Sleep with an extra pillow or put it between the mattress and box spring for a more gradual slope to help nasal drainage. Regular exercise also strengthens your immune system. Animal experiments have shown that animals which performed mild exercise as soon as they were exposed to the flu virus had better recovery rates. This is because the exercise aids circulation of the lymph fluid. Avoiding sugar is important as it significantly impairs immune function by lessening the activity of white blood cells. Get good nutrition with plenty of fresh fruits and vegetables. Eat immune-boosting foods such as garlic, green tea and cayenne pepper. Echinacea and elderberry are herbs that many people use to help their immune systems. If you think you have been exposed, increase your intake of garlic or try grapefruit seed extract. Colloidal silver is an effective germ-fighter and was regularly used before the advent of antibiotics to fight infection. Wash your hands often, especially in flu season or when in public places, or use hand sanitizer. Do your best to avoid spreading anything you have to others. Avoid touching your eyes, ears, nose and mouth with your hands. If you don't have a tissue you are better to cover your coughs and sneezes with the crook of your elbow. The germs are largely caught by the fabric rather than being broadcast in the air and on your hands to spread to whatever you touch next. One of the best cold remedies is to avoid it in the first place. Drinking adequate water is always important especially when you are sick. Your mucus membranes need to be well hydrated. All that mucus you are producing is a means of your body throwing off waste matter. Blow your nose often rather than sniffing the mucus back. Block one side while clearing the other; it takes less pressure that way and is less likely to force mucus further into sinus cavities. Apply a hot, moist washcloth over your nose and sinus areas. This can feel good and helps to relieve congestion. Steam showers can help moisturize nasal passages. Artificially heated room air tends to be very dry and this is hard on the mucus membranes. Saunas have been shown to help as the air is too warm for the germs to survive. Also, fresh outside air and sunshine are healthy for you and hard on those germs. Reduce and learn how to handle stress as it affects your general health and makes you more susceptible to illness. Prolonged stress is at least partially responsible for most illness. Try to avoid unnecessary travel, especially by air as congestion and sudden pressure changes do not go well together. Every area of lifestyle is important in maintaining good health. Aside from the areas listed above check the free doctor advice page for other areas. Also, consider a good antioxidant product to give your immune system a boost and to protect your system against free radicals. Elderberry has been used in traditional medicine as a remedy for colds and flu for centuries. Scientists are now determining that elderberries appear to have antiviral activity. Researchers reported in The Israel Medical Association Journal that black elderberry extract activated the immune system by boosting the production of cytokines, which are small protein molecules secreted by immune calls. The Journal of Internal Medicine Research reported that flu patients who took elderberry syrup (15 milliliters 4 times a day for 5 days) had symptom relief 4 days earlier than those taking placebo. There are many elderberry extract products or go out in the fall and collect your own elderberries. Zinc has been shown to slightly decrease the duration colds. In a study in The Annals of Internal Medicine, 48 subjects with cold symptoms took a lozenge containing 12.8 mg of zinc or a placebo every 2-3 hours. The zinc group had symptoms for 4.5 days compared with 8.1 for the placebo group and had less coughing and nasal discharge. The American Journal of Therapeutics, found that zinc lozenges prevented or reduced the number of colds in school-age children. A very simple thing to do at the first sign of a cold which, for me, is usually a slight tickle in the throat is this: Take 10 deep breaths as follows. Breathe in through your nostrils by first expanding the diaphragm and then the chest so that get a full inspiration of air. Hold for up to 30 seconds but not to the point of having any difficulty. Release slowly through your mouth. Repeat until you have done ten. You can do this a few times in the day. You may find it easier if you are standing. You might notice that it tends to deepen your regular respiration. I am not sure why this is so effective (and, if done early enough, it truly is!) except that the bad anaerobic bacteria are favoured by low oxygen conditions and this procedure introduces much more oxygen into your system before the viruses have had opportunity to proliferate. It's one of the best early cold remedies. Another resource of useful information about the common cold is http://www.home-remedies-for-you.com/remedy/Common-Cold.html.